Arctic Monkeys: Anarchy from the U.K. The punk rock group Arctic Monkeys is clambering up the British music charts. Their debut album is soon to be released in the United States. Influences include Oasis and The Clash, but they have their own sound. Arctic Monkeys: Anarchy from the U.K. The punk rock group Arctic Monkeys is clambering up the British music charts. Their debut album is soon to be released in the United States. Influences include Oasis and The Clash, but they have their own sound. A new British band is about to hit the U.S. scene big. The explosive punk rock of the Arctic Monkeys is coming your way with the release here of their debut album, Whatever People Say I Am, That's What I'm Not. Here's DAY TO DAY music critic Christian Hoard with a review. Much of the music on England's pop charts over the past few years has come from bands putting new twists on stripped down rock and roll, from London's Libertines to Detroit's White Stripes. But no one could have quite predicted the stir caused recently by a little band from Sheffield, England called the Arctic Monkeys. Last month their excellently scrappy first album, Whatever People Say I Am, That's What I'm Not, sold nearly 400,000 copies in its first week on sale in the UK making it the fastest selling debut in British history. At home the Arctic Monkeys are press darlings, and they're all over British radio with singles like this one, I Bet You Look Good On The Dance Floor. HOARD: The Arctic Monkeys came together in 2003 as a bunch of teenage students with a shared love for Oasis, The Smiths and The Clash. Their frontman, Alex Turner, still isn't old enough to drink legally in the states, but Turner's songs know from nights on the town. Packed with ragged guitar grooves that threaten to careen out of control, references to debouched teenagers, and singing that shifts from Johnny Rotten's sneer to cracked croon, Whatever People Say I Am revokes the vertiginous pleasures of carousing with friends, chasing girls and letting the future worry about itself. HOARD: Listening to Whatever People Say I Am, you can hear the anthemic energy of The Clash, the Brit-centric tunefulness of The Kinks, and the pithy wit of The Smiths. But for the most part, the Arctic Monkeys overcome any obvious borrowings by jamming together little thrills with a combination of youthful flair and cheeky pop smarts. Then there are Turner's lyrics, which sharply render characters you might run into on any given night at a Northern England pub. Aggressive bouncers, jaded scenesters, and so-called chavs, working class lads fond of lager and Burberry baseball hats. One of the album's best songs is Fake Tales Of San Francisco, in which Turner surveys the posturing and debauchery at a local rock club with the wary knowing eye of a kid raised by TV. HOARD: Whatever People Say I Am suffers a bit from the Arctic Monkeys' somewhat limited bag of tricks. Still, it's the kind of pop record that assaults eardrums while targeting pleasure sensors, and it never feels small. Their band may not be your life, but even on softer cuts like this one, Marde Bum, the Arctic Monkeys can make you feel 19 all over again. 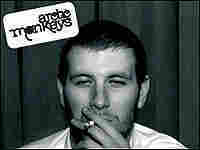 BRAND: The band is the Arctic Monkeys. The album is Whatever People Say I Am, That's What I'm Not. Christian Hoard was our reviewer. He's a contributor to Rolling Stone magazine. He lives and works in New York City.